Chart No. 21 - Sacral Release by a Support Underneath and Directional Force Applied Posteriorly and Laterally. The anterior sacral base is usually the sore side and is tender to the touch, regardless of which is the short leg. Many times pressure on the same innominate [hip] toward the floor releases the articulate tension and pain in this neuter [neutral] joint. There is a definite relationship between the anterior sacral base and the lateral atlas on that side. These joints need careful checking as they are the two poles of the housing of the vital forces. A posterior dorsal [thoracic] curve also has its relationship and effect on the sacro iliac [sacroiliac] articulation release. This is the basis for most pelvic tension release. No bony adjustment is aimed at here. Only the release of spastic tissue by directional force correctly employed to balance the sacral base and the vital force relationship with the rest of the body's energy fields. 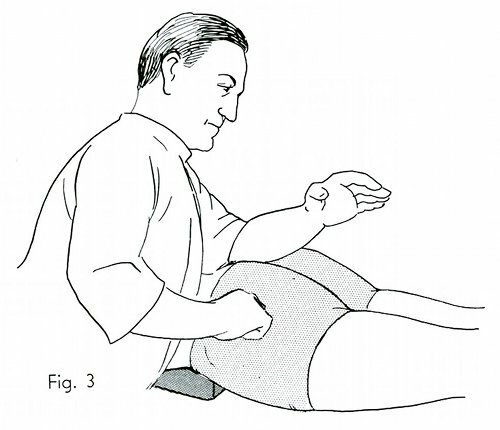 A position face down with a firm cushion support above the pubis, to raise and support the sacral base. 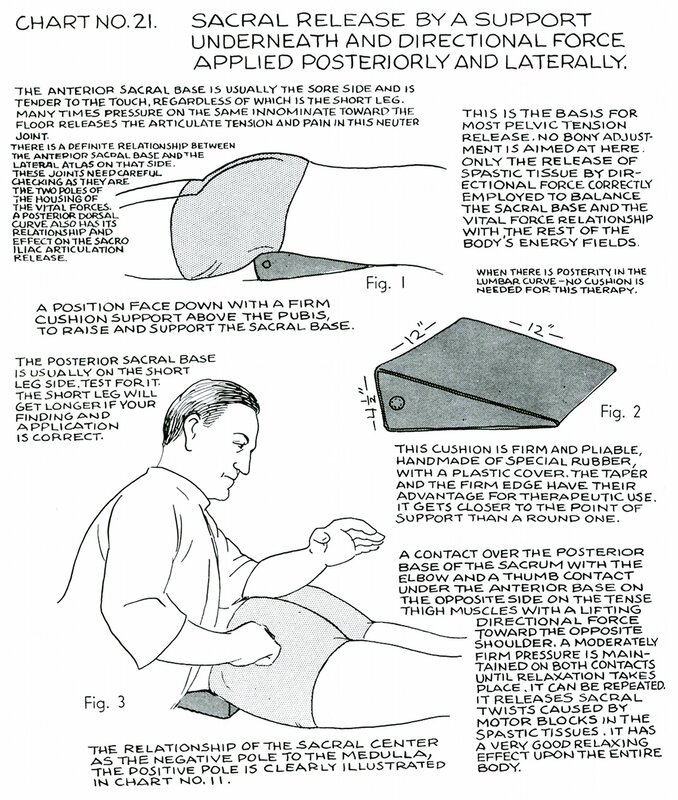 When there is posterity [posteriority] in the lumbar curve - no cushion is needed for this therapy. This cushion is firm and pliable, handmade of special rubber, with a plastic cover. The taper and the firm edge have their advantage for therapeutic use. It gets closer to the point of support than a round one. The posterior sacral base is usually on the short leg side. Test for it. The short leg will get longer if your finding and application is correct. A contact over the posterior base of the sacrum with the elbow and a thumb contact under the anterior base on the opposite side on the tense thigh muscles with a lifting directional force toward the opposite shoulder. A moderately firm pressure is maintained on both contacts until relaxation takes place. It can be repeated. It releases sacral twists caused by motor blocks in the spastic tissues. It has a very good relaxing effect upon the entire body. The relationship of the sacral center as the negative pole to the medulla, the positive pole is clearly illustrated in Chart No. 11.